M3 Bitlocker Loader for Windows is a free encryption software to create an encrypted container which is compatible with Bitlocker Drive Encryption so that the drive is protected by Bitlocker in Windows 10/8/7 Home and Windows 7 Professional. 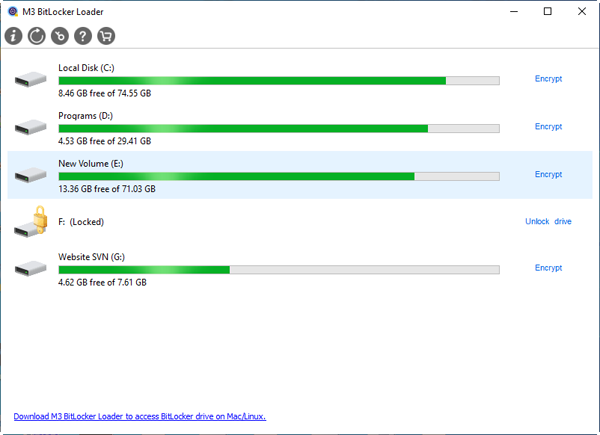 M3 Bitlocker Loader for Windows is a freeware for Windows 10/8/7 home users to create an encrypted container which is compatible with Bitlocker Drive Encryption so that the hard drive, external hard drive, USB drive, flash drive, SD card, etc. is protected by Bitlocker in Windows 10/8/7 Home and Windows 7 Professional. FileHopper Mobile for Android is a cloud-based hub for your file, helping you be more productive and organized.